I’ve had enough of music managers. One supports only iPhones, one syncs only playlists, one doesn’t detect devices, one can’t cancel an accidental whole drive sync, etc. I know they sometimes work, I also used them in the past but this time they simply refused to work as I wanted. I tried MediaMonkey, MusicBee, Windows Media Player and a few others, until I thought, why not use a simple sync application? You know, from the same category as rsync. 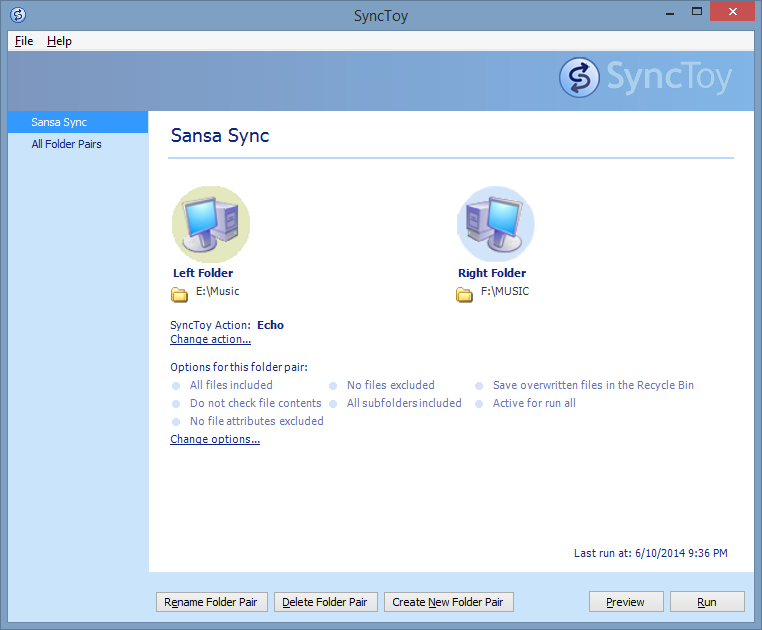 I looked what is available for Windows and found something interesting from Microsoft: Microsoft Sync Toy. It allows you to select two folders, choose if you want to just copy or also delete from the destination folder and that’s about it. No hassles, simple, just as I like. Note that you have to set your music player to connect as an MSC device instead of MTP. This means connect as a drive instead of a media device.